Personal mobility means the freedom to enjoy the outdoors as well as the comfort of one’s own home. This is where an outdoor stair lift can help bring personal mobility back to outdoor life. One of the first questions when considering an outdoor stair lift will be about cost. There are plenty of payment and finance options designed to help you bring an outdoor stair lift into your life. You can request a quote online or call for a quote. Monthly financing is also an option. With a fixed interest rate loan, you will always know the amount of your monthly payment. Those monthly payments can start at $89 a month. Monthly payments may be higher depending on other factors such as loan term, the final amount financed and APR. The payoff with an outdoor stair lift is being able to lift that feeling of confinement. Choosing the right outdoor stair lift will make all the difference. The Indy Outdoor Stair Lift is built to last, designed to withstand rain, storms and the changing of seasons over several years. The stair lift is protected by weight-tight covers that come standard with every Indy Outdoor Stair Lift. Comfort and durability are also a huge part of the Indy Outdoor Stair Lift. It features a 19-inch wide seat that swivels 90 degrees. The stair lift can support up to 350 lbs. and a folding footrest. The outdoor stair lift also offer versatility. It can be installed on either side of a stair case and mounts directly to the stair lifts. 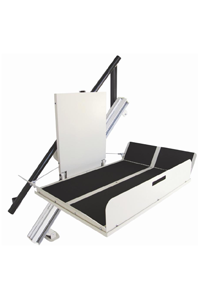 Contact Indy Stair Lifts today to find out more on pricing options.